Some say that good friends help you move. I say good friends share their personal morel stash with you. Very, very good friends, indeed. Can't wait to munch on these babies (neither can Huxley, clearly, as he almost took a bite out of one as soon as we handed it to him, but not before Mama quickly grabbed it back!). Check back in soon to see what we cook 'em up into! Happy Friday, friends! I've been busy, busy, busy all week, working on various freelance projects. Soon as they're up and running, I'll share them with you. So many balls in the air at one time! It's good, though. I'm an ants-in-the-pants-gotta-keep-moving sort of gal, so staying busy suits me just fine. *This new magazine for families is beautiful (via Gabrielle). *Cake, cake, and mo' cake (via Jen). *Nettle foraging from two bloggers I love. 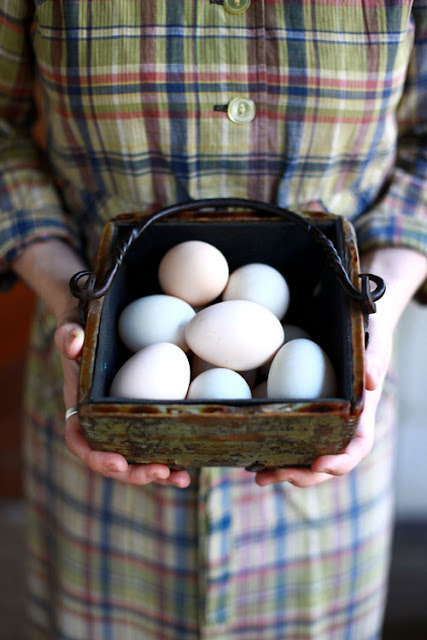 *Eco eggs (& eco grass, too)! *Love the styling, color palette and videos of this online magazine. *Finally, cool ties for menfolk! Also, I've got a post up on Design Sponge today, all about eating edible wild flowers. We've gone crazy eating from our yard this past week. SO fun! Hubs and I are tag-teaming viewing The Hunger Games today. He's at the show now and I'll catch a showing later today. Super pumped. Have you seen it? What's your take on the adaptation to the big screen? Wherever you go this weekend, whatever you do, may it be grand! Some blogs you go to because they make you inquisitive and speculative, offering contemplative morsels for rumination. Others you go to because they always have a good take-away something or other, whether that's a recipe for rye crumble bars or links to new (to you) artists. And then there are those you go to for a chuckle, a chortle, a guffaw, or an all-out belly laugh. 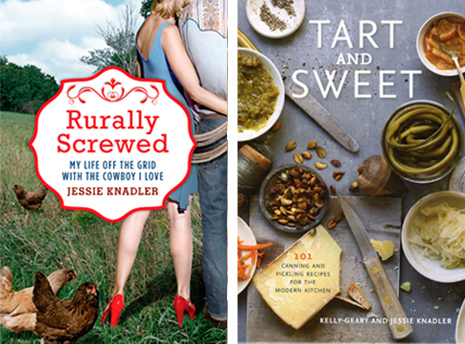 Jessie Knadler and her blog, Rurally Screwed, get filed into the latter category. I'm not sure how I found Jessie's blog. It was several years ago, and it was winter. Those are the specifics I recall with any degree of clarity. It doesn't really matter how I found her, though, because once I sampled her wry wit and outsider's take on life in the mountains of southern Virginia, I knew I'd be back. In Rurally Screwed, Jessie calls it like she sees it. Whether it's her daughter, her marriage, her husband, her town's citizens or herself she's got in her cross hairs, Jessie gives it to you straight. And it's always hilarious. I'm super excited, then, to showcase Jessie's newest venture, Rurally Screwed: My Life Off the Grid With the Cowboy I Love. This is the tale of how this (at the time) Manhattan-based, designer label-wearing, Kundalini-practicing, hard-partying women's magazine editor met, fell in love with, and went on to marry Jake, a man who, at least on the surface, seems in every way her polar opposite. He's a Garth Brooks-listening, cowboy hat-wearing, church-going ranch hand and the two find salvation in each other at an untrained horse & bull-riding rodeo she's covering in Montana, her home state. Since initially discovering her blog, Jessie and I have gone on to become cyberspace buddies. We've reviewed one another's books (Jessie also co-authored Tart & Sweet) and shared ink in two magazine articles. I think she's grand. She's brassy and ballsy and gutsy and every other superlative you can apply to a brave person. In her novel, she takes a very candid view of her marriage, her surroundings, and herself. She puts it all out there, which is truly admirable, given the subject matter and just how intensely personal it is. I applaud her for it. Her book is an absolute gem and she's a treasure for having the vim, vigor and gumption to share her story with the world. In celebration of her book's launch (it officially publishes Tuesday, April 3rd, the same day my not-so-little-anymore sister, Theo, turns 21!!! ), Jessie has graciously gifted me with a signed copy for one small measure reader. To be entered in the giveaway, simply leave a comment below. I'll randomly choose one winner next Wednesday, April 4th, midnight EST. In your comment, please leave a means of reaching you should you be the winner, via either a link back to your blog or website, or by leaving your email address in your comment. Even if you don't end up winning the book, give it, and Jessie's blog, a read anyways. The woman knows how to keep you both enraptured and in stitches at the same time, dispensing one country-living observation and witticism after the other. UPDATE: I love how much you all love Jessie! She's true blue, that one! The winner of a signed copy of Rurally Screwed is #91, Sage. Thank you everyone that entered, and congratulations, Sage! This past winter, the lovely and talented photographer, blogger, and author Jen Altman came over to photograph my little family. The images were to accompany a piece I wrote, Chicken & Egg, for Kinfolk magazine. We simulated a spring day, as I donned a vintage madras shirt dress and we set about shooting outdoor images in the cove. It was a great experience. Jen is an extremely confident photographer, holding the vision in her mind's eye of exactly the image she intends to capture, and then going for the jugular to seize it. I love her creative process, as well as the woman herself. She's a dream to work with, and a treasured friend, becoming even more so with each passing day. She's also mama to three exquisitely lovely daughters, wife to the equally kind and loving Denny, an accomplished cook and baker, and just a general righteous lady. Today Jen is featuring me as a guest poster on her food blog, Nectar (be sure to check out Nectar & Light, her other blog, which is always full of incredible eye candy, personal musings, and all kinds of inspiration). My post features outtakes from our Kinfolk photo shoot, along with the recipe we created for my piece. Jen always posts a playlist with her recipes on Nectar, as music is an incredibly integral part of her life. She asked me to put together a playlist to go with my post. I'd never done that before but, man. I gotta say, I'm hooked. I might just go on a playlist bonanza now. It was SO easy to do. Hope on over to Nectar for my Bacon, Collard & Parmesan Frittata recipe. And stick around her site for a spell. 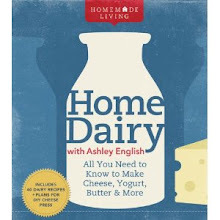 It's a beauty, packed with images and recipes that will have you walking away from your computer and into your kitchen to get down to business. They say imitation is the highest form of flattery. Owing to that, Huxley is constantly attempting to do whatever it is that we're doing. This is often cute. Sometimes, though, it makes for extra work for myself and Hubs, like when we're working in the garden, digging things. Huxley has been going behind us, digging those things back up. Until now. A few weeks ago, at the home of a close friend, Huxley discovered the remnants of a former sandbox. The structure itself had been removed, but the sand and some scoops remained. He went crazy for it, digging like a madman. Hubs took note, came home, and began building the tiniest English man a sandbox of his own the very next day. To say he loves it is an understatement. Clamors for it would be closer to the truth. Pretty much five or so minutes after waking up each morning, he asks "Outside?" followed by "Bing ging?," which, for reasons unbeknown, is the word he's taken to calling the sand box. It's the best. thing. ever. for us, too, as it keeps him occupied and content while we toil the soil. Our garden is fenced, and having the sandbox in the garden allows us to safely keep an eye on him. The roof keeps the sandbox dry and shades his sensitive skin so that he doesn't burn, great news given his pasty Scottish lineage. Hubs also built it so that Huxley wouldn't quickly outgrow it, incorporating plenty of details to keep his imagination occupied as he ages. Hubs surrounded the sand box with a stone moat (with a barrier of landscape cloth underneath), which has multiple functions. It's entertaining, aids in water drainage, and helps control the overflow of sand. Rocks buried in with the sand keep things interesting while the larger stepping stones in the moat provide a sturdy walkway when he wants it (we used both pavers and a granite slab we had on hand). The boxes and shelves help in a variety of ways. They strengthen the structure, provide imaginative spaces, and leave plenty of room for storing his various scoops, spoons, and toys. The curved lines and hole cutouts add whimsy. Hubs added bamboo kitchen utensils, scoops, buckets, a kid's shovel, and some recycled plastic toys to the box (including this dump truck, a gift from friends). The quote that tops the sand box is a line from a folk song, famously covered by Billy Bragg. It refers to the Diggers, a group of 17th century British agrarian dissenters. They believed land should be available to all, and grew crops on unused land. You can read more about them here. If you have the space, I highly recommend putting a sand box in your garden. You can make it as palatial or as humble as you'd like. If you choose to build one, let your imagination run wild. Hubs refers to his design esthetic as "Dr. Suess-esque." No matter how you build it, this much is true: hours of good times for wee ones and their parents alike will be had! To see many, many, many more photos (we couldn't stop!!!) of the sand box, go here. The Blue Wheaten Ameraucanas are laying! They're little things, both the pullets and their eggs, but, oh, look at that blue!!! Happy Friday, friends! It's a rainy day in the cove this morning, which is just fine by me. I planted peas, carrots, beets, mustard greens, two types of lettuce, spinach and arugula this week and they could all benefit from a good soaking. Those new crops, coupled with the already growing red and green cabbages, Brussels sprouts, mustard greens, kale, and collards that made it through the winter intact should make for a pretty banging spring garden. I'm SO excited. Last year, I had a tiny guy that never wanted to leave my arms and a new book I was feverishly working on to keep me from getting as fully engaged with the garden as I would have liked. The year prior, I was pregnant and could barely manage to stay awake for more than 3 hours at a stretch during this time of year (man, did I ever sleep then!). It feels so invigorating to have the wherewithal to get out in the garden every day now. Huxley loves it out there, too. He tromps around and plays and digs and moves plastic plant pots and straw and fistfuls of dirt all over. It's just the best. *Garden Betty's seed tape is easy, and genius. *Speaking of seeds, this windowsill kit it lovely. *First he gave us nettle pasta, now it's nettle risotto. *Plants that are just as "clean" as they are green. *Who needs space to grow potatoes? *The Lavender Lover's Handbook? Yes please! *Love this N.C. artisans endeavor. *It's the time of girl hunters. *Chocolate chicks and eggs of bliss!!! *That's not green slime, that's fuel. We're meeting up with friends in town this evening for beers and food truck eats. Sunday will have us tag-teaming birthday parties like we did two weekends ago, with a 38 year-old's soiree early that day and a 2 year-old's bash in the early evening. Should be a great time. Wherever you go this weekend, whatever you do, whomever you do it with, may it be grand! To me, spring is definitely in effect when I see the wild violets. When these beauties start popping up all over the cove, I know it's only a matter of time before rabbits will start hopping through the yard again, the ferns will unfold their fronds, and we'll be cooking ramps into any and everything. For now, though, the focus is on the violets. We carefully gather them up and then toss the delicate petals onto all kinds of dishes. So far this week, we've had them atop an Herbs de Provence (my most beloved culinary herb blend) & mozzerella frittata, scattered over blueberry pancakes drenched in just-made maple syrup from Amanda, and tossed into a garden fresh salad. I have a recipe for homemade mozzarella in my Home Dairy book and one for a frittata in Keeping Chickens, if you'd like to give a go at recreating this dish yourself. For the pancakes, we turned to our tried-and-true Pancakes of Perfection (to get them as fluffy as ours, take that extra step in the recipe to separate the yolks from the whites, and then beat the whites until soft peaks form). From my research, all species of violets are edible. That said, if you find some in a heavily trafficked public park (where all manner of dogs do their "business") or alongside a busy road, those might be best passed over. In a forest, your yard, a neighboring yard (with permission, of course! ), cemetery or other quiet place, these babies are yours for the picking. It's official, spring has sprung! On this first day of the season, there is no doubt that the time of flowers and growth and abundance is upon us. I don't know where you live, but here, the daffodils have already peaked, the tulips are emerging from their slumber party in the soil, and the apple trees are shamelessly showing off their pink finery. Spring. Is. Here. This fecund green season is the time of projects for many of us. It's also the time many newbie beekeepers and chicken-tenderers dip their toes into the age-old waters of animal husbandry. In recognition of that, and of all of this new life in the soil, on the ground, in the air and, well, pretty much everywhere, I'm giving away copies of two books in my Homemade Living series to one small measure reader, Keeping Bees today and, in a few weeks, Keeping Chickens. Yield: 8 ounces (1 cup). *Herbal infusing options include: basil, chamomile, lavender, lemon balm, marjoram, peppermint, rosemary, rose petals, sage, spearmint, tarragon, and thyme. Spice infusing options include: allspice berries, anise seeds, cardamom pods, cinnamon stick, citrus peel, whole cloves, gingerroot slices, star anise, and vanilla bean pod. 1. Sterilize either two 4-ounce or one 8-ounce jar(s) by submerging into boiling water for about 30-40 seconds. Using a cloth, dry completely, leaving no traces of water whatsoever. 2. Place infusing agent of choice into the jar(s). If using fresh herbs, use 1-2 sprigs; if using spices, use 1-2 teaspoons, depending on intensity of flavor desired. 3. Put honey into a stainless-steel pot. Warm over medium-low heat until it moves easily in the pot, appearing completely “runny.” Don’t allow the honey to boil, only to be fully warmed. 4. With the aid of a funnel, pour honey into each jar, completely covering the infusing agent. 5. Allow jar(s) to cool at room temperature. Once fully cooled, place a lid or cork (depending on bottle being used) over the jar’s opening. 6. Store in a cool, dark area, such as a pantry or basement. Allow to infuse for at least one week before use, two weeks if at all possible. 7. Use within one year. *If you’d prefer, you may also strain off the jar’s contents, composting the solids, after the one-two week infusing period. To enter the contest, simply leave a comment below, stating why you'd like to keep bees. Canadians, feel free to enter, but know that, should a Canuck be the winner, we'll have to (sadly) forgo the honey, as international shipping of food items gets dicey. I'll run the giveaway until next Wednesday, March 28th, ending at midnight EST. The birds and the bees are doing their thing! Now, do yours! 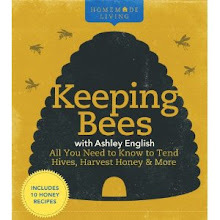 UPDATE: The winner of my "Keeping Bees" book and infused honey is Heather of Whatcha Buildin?"! Thank you so much to everyone that entered!!! The longer Hubs and I are together, the more we find ourselves gravitating towards, and enjoying immensely, the slow life. That's to say, these days we like to cook the oats that take 30 minutes over the 1 minute variety. We find satisfaction in the time it takes to light the wood stove and keep it going. We love waiting for the French press to steep the coffee. We like the long, rambly conversations where time gets lost and the days drift languidly by. It turns out, after our visit this weekend in Maine, that we're not the only ones enjoying what I think I'll call the "molasses" lifestyle. Based on her writings, and our correspondences and phone conversations, I knew that Amanda Soule and I had an affinity towards one another. I also suspected that our spouses and children would dig each other, too. Little did I know just how much, though. The Soules and Englishes are living parallel lives, it would appear. Our friends to the north also love to gather around the long dining table for home-cooked meals, take ambling walks in the woods, and savor all of the richness life has to offer best witnessed when you slow down. They are uncommonly kind, and generous, these sweet Soules. From homecooked meals to bedside bars of chocolate placed atop our bath towels, from jars of home-boiled maple syrup sent home with us to children willing to share their every last possession (not to mention their bedrooms-thanks again, Calvin! ), these folk are what we in the South call "good people." *Saturday: The Soules were boiling maple sap in their woodshed when we arrived and Amanda offered us homemade chocolate chip muffins and cups of warm sap to sip as we gathered to watch the sap boil. We then headed indoors for exceptionally delicious bowls of turkey, carrot and kale soup (made with the family's own turkeys meat and stock), served alongside chunks of Irish soda bread we picked up at Scratch bakery in Portland and Urban Fermentory hard cider (another fantastic local offering). We returned back to the outdoor wood stove, where Amanda served us amazing hot toddies before taking a tour of the parcel on their land they plan to turn into pasture for a future flock of sheep and a dairy cow. That night we enjoyed a soul-satisfying dinner of pulled pork (again, from their own animals) with homemade barbeque sauce, salad with scrumptious dressing, roasted beets and, my favorite, roasted brussels sprouts. SO good. *Sunday: The family all gathered around the kitchen table that Steve built (so very beautiful to view it up close!) for a hot breakfast of their chicken's eggs, the family's bacon, local yogurt, apple butter and bread. We headed into town and while Amanda had an editorial meeting for Taproot, Steve, the kids and we three Englishes savored the beach at Kettle Cove. That was followed by the Taproot event at Longfellow Books, such a lovely, well-supported community bookstore. Josh, the owner of 158 Pickett St. (and, in a stranger-than-fiction sort of way, the brother of my close friend Jess here in Asheville) then opened up his cafe for Amanda for an after-hours private party for the magazine's contributors and their families. The chicken salad, pimento cheese, hummus with feta and olives, and cucumber sandwiches they served were divine, as was the bottle of Knob Creek the beautiful Stacy Brenner contributed. We'd also savored 158's much-lauded bagel sandwiches Saturday morning before heading out to the Soule's place and can attest for just how transcedent they truly are. *Monday: We awoke to the otherworldly aroma of granola baking. That was munched on with chopped apples and pears and topped up with creamy local yogurt and enjoyed alongside mugs of hot coffee (French pressed, naturally!). It's always great to meet anyone new. Like I wrote a while back, I'm down for connecting and chatting with all kinds of folks, whether we share the same habits, routines, preferences and predilections or not. That said, there is something so comforting about the seamless kinship that is cultivated with others that share your way of viewing and doing. The Soules are "our people" and we can't wait to return the hospitality chez English. You can view more photos from our Soule-stice here. Happy Friday, friends! We three Englishes arrived in lovely, quaint, damp Portland, Maine this afternoon. Huxley was a total rock star on the flights, playing on the Asheville-Atlanta flight and then sleeping for all but the last 20 minutes of the Atlanta-Portland flight! We found an adorable French cafe for dinner (savory crepes! sweet crepes!) and then gorged on local gelato for dessert. We're totally tuckered out and looking SO forward to heading to the Soule homestead in the morning. *Grapefruit olive oil cake (via Heidi). *My go-to jam this past week. *Loving this new (to me) blog. *Grow it, then drink it. *Sweet Paul's spring issue is so, so lovely. *Cheddar and Guiness beer bread? Have mercy! *Gwyneth has caught the buzz! *Great recipe for all-natural homemade play dough. I'm so excited to meet some of the other Taproot contributors at Longfellow Books on Sunday. If you're in the area, do stop by and say howdy. It's sure to be a great time. Introducing Rooster Cogburn, or R.C., as we call him. A Blue Wheaten Ameracuana, this little fella just started crowing last week. It's a fine yelp, heard clear across the cove. He's a sweet guy (at this point), allowing us to pet and handle him, for the most part. Hopefully that will continue to be the case. We were reluctant to add a roo to the flock for some time, as I harbored some painful (literally) memories of my mother's former far-from-friendly guy, George. After much discussion, we ultimately decided to give it a go, welcoming the protection from predators a rooster offers. Additionally, we added three female Blue Wheatens to the mix when we purchased him, with the intention of R.C. siring both their and the other flock member's offspring. Plus, blue eggs!!! We'll see how it all turns out. So far, so good. And he's looking mighty fine, if I do say so myself! I can't be completely certain, but I think that, before this past Thursday, the last time I ate a pork chop was sometime circa 1993. Aside from some Jimmy Dean rounds cut right from the tube and fried until crispy (to be served alongside the Saturday morning breakfasts of my youth-sausage, eggs, biscuits and "fried" apples), my house didn't consume that much pork. Pop was a greater consumer of the "other white meat" than was my mother, and when my brother and I would visit he and his wife, they'd occasionally serve a grilled pork loin. Aside from those weekend breakfasts, or trips to see Pop, however, I didn't much dine on swine. Until now. These days, I can't get enough pork, in any incarnation. As it was just shy of two decades since I'd enjoyed a pork chop, Hubs thought it was high time I dined on some of the area's premium porcine offerings. Hickory Nut Gap Farm, one of our favorite local meat suppliers, pastures their pigs in a forested setting. Having visited the farm last June and witnessed pigs expressing their unique "pigness" (as Joel Salatin would say) firsthand, with all of the contented oinking, mud-cavorting, tree-rubbing and such that state entails, I know the chops we supped on lived fantastic lives, full of loving care and attention. Continuing with our sorghum recipe pursuits, we cooked the chops with a sweet glaze, redolent of barbeque, but absent the cloying sweetness that so often accompanies that condiment. We used thick, un-pounded cuts, permitting all of the cut's inherent moisture to stay intact. In short, they were sublime. Magnificent. Stupendous. Can-I-have-another-even-though-I'm-crazy-full good. You see where this is going? And the collards? Far from a second thought to simply round out the dish, they were the co-star that made the dish truly shine. The Brad Pitt to the chop's George Clooney. The Laverne to their Shirley. We've got loads of collards in the garden, coming up strong and proud from an autumn planting. A generous bunch was cooked with bacon (welcome to swine country, folks) and then, once on the plate, doused in a generous lashing of Mountain Farm Lavender & Blueberry vinegar. Add some mashed sweet potatoes with a generous bit of cream, butter and cinnamon and you've got a meal that helped the South become what it is today-sweet, sticky and scrumptious. 1) Mix together the paprika, salt, coriander, garlic, and pepper in a small bowl. 2) Sprinkle about 2/3rds of the mixture onto both sides of the pork chops. Place on a plate, cover, and set aside for about 30 minutes. 3) Mix the remaining spice mixture into the flour in a medium-size mixing bowl. Coat the pork chops with the flour mixture. 4) Add the grease, or oil to a cast iron or similar heavy-bottomed pan. 5) Sear each side of the pork chops over medium-high heat for 3-4 minutes per side. 6) Turn the heat down to medium low, and add the remaining ingredients. 7) Cook for about ten more minutes, turning the chops every few minutes. 8) Remove from pan, and spoon the remaining sauce over the pork chops. 9) Let them sit for a few minutes before eating. 1) In a dutch oven or similar sized pot, cook the bacon over medium heat until it starts to get a little crispy. 2) Add the onions, and cook for about 10 minutes more, breaking up the bacon as you stir. 3) Add the collards, and cook, stirring frequently for a couple minutes. 4) Add the rest of the ingredients, and turn the heat to low. 5) Cook for about 45 minutes, stirring occasionally, until the liquid has evaporated. Happy Friday, friends! Huxley and I just returned from trying out "Mighty Mites," which is essentially baby gymnastics. He was crazy for it! From the pit of foam cubes to the climbing mats to the trampoline, his little baby body and mind were struggling to contain his exuberance. Best $5 I think I've ever spent! *Anna's videos of recent projects are so fun! *This book (from an N.C. chef!) looks wonderful. *Want to work on a farm, anywhere in the world? 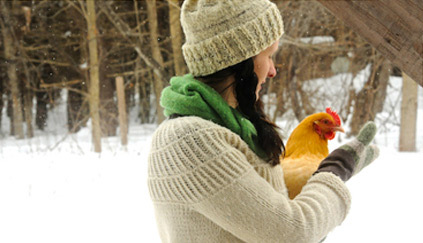 Go WWOOF-ing! *This Swedish retreat is stunningly gorgeous (via Alison). *Online children's clothing consignment! YES!!! *Soap with a mission (via Joy). *Reviving a Victorian greenhouse (via Jessie & Melanie). *Blossom parents like I do! We've got a whopper of a social weekend planned. There's a birthday of a one year-old tonight, then a two year-old's party tomorrow morning, followed by that of a 40 year-old tomorrow night. Phew! Should be a good time!!! *Mighty Mites had the added bonus of making Shorty crash, hard! Oh, friends. Have I got some NEWS! Next Friday, at 9:55 a.m., Hubs, Huxley and I are hopping on a plane and heading to the chilly shores of Portland, Maine! When Amanda posted the two launch events for Taproot a few weeks ago, on a lark I imagined attending the Portland Longfellow Books reading, and all of the logistics it would take to make that happen. Enter some frequent flier miles and hotel points from my ever-generous in-laws, along with an invitation to lodge with the Soule clan for a night or two, and my "what if" morphed into reality. I couldn't be more thrilled. Not only do I get to be present at the launch party of a publication I am honored, humbled and, well, just super pumped to write for, myself and my tiny tribe will get some real-time hang-time with Amanda and her considerably larger one! Double win!!! If you're in the area, I'd love to meet you. 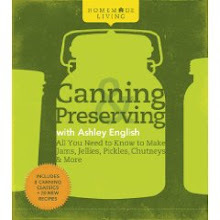 You can read details about the event at Longfellow Books here. Stop by, tell Amanda what a righteous lady she is, and let me give you a hug! Have you ever visited an apple orchard at the height of that fruit's season and thought to yourself "Oh man, I'd love to dine at a long table here, buttressed by Pink Ladies on one side and Arkansas Blacks on the other"? Or visited a local farm for eggs and imagined what it would be like to eat a meal on site, at a cloth-clad table, chowing down on the site's eggs and other provisions? Outstanding in the Field is a roving culinary adventure – literally a restaurant without walls. Since 1999 we have set the long table at farms or gardens, on mountain tops or in sea caves, on islands or at ranches. Occasionally the table is set indoors: a beautiful refurbished barn, a cool greenhouse or a stately museum. Wherever the location, the consistent theme of each dinner is to honor the people whose good work brings nourishment to the table. Ingredients for the meal are almost all local (sometimes sourced within inches of your seat at the table!) and generally prepared by a celebrated chef of the region. After a tour of the site, we all settle in: farmers, producers, culinary artisans, and diners sharing the long table. I love this concept. We have a field on our property that we refer to as the "lower field," simply because it is located down the hill from the house, which sits up on a knob. Hubs and I have long discussed how fun and amazing and inspiring and beautiful it would be to have a meal in that field. We love the idea of tables and chairs positioned down there, heaving under bowls and platters of locally sourced food, as guests feast and relax and enjoy the splendor of it all. Jim Denevan has put together a gem of a cookbook inspired by his transient repasts. Outstanding In the Field is a truly wonderful book. Equal parts stunning and inspiring, it'll have you trawling farmer's markets as soon as the first offerings of spring appear. I'd like to give away a copy to one small measure reader. All that's needed to enter is to leave a comment below detailing your favorite seasonal item to cook. It's SO hard to choose, but if backed into a corner and forced, at knifepoint, to choice, I'd probably say basil. Fresh from the garden and pulverized into submission, nothing tastes more redolent of "summer" to me than just-made basil pesto. Just thinking of it now has me wanting to trade my felt slippers for flip-flops, my flannel p.j. 's for a tank top. In your comment, please leave a means of contacting you, should you be the winner, via either a link back to your own blog or website or with your email address. I'll run the giveaway through next Wednesday, midnight EST. Canadians, feel free to comment away. I'm planning to begin hosting a number of themed potlucks out here in the coming seasons. Who knows. Maybe the lower field will finally embody that food-laden vision Hubs and I have been tossing around all of these years! UPDATE: Oh my goodness, I totally forgot to announce the winner! Big congratulations to EcoGrrl! And thank you so very much to everyone who entered! Walking around the UNC-Asheville campus this past weekend for the Organic Grower's School (SO much fun! ), the abundance of spring blooms on display was profound. Hyacinths, daffodils, tulip magnolias, camellias, muscarii, snowdrops-the works, all showing their finery and offering incontrovertible proof that spring is 'a knockin. A winter's worth of shut windows, co-mingled with woodstove dust and animal fur always renders the house in a fine layer of what we'll call "life grime" come March. Which gets me itching to clean. And not just any clean, but pull-everything-out-of-the-pantry clean. Rearrange-the-drawers clean. Go-through-the-attic-with-boxes-and-a-permanent-marker clean. You get the jist. Oh yes, it's open season on muck and mess and I've got my spray bottle loaded and pointed. One area I'm constantly at war with is my pantry. 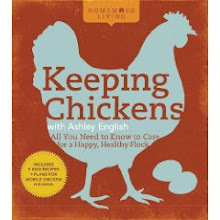 It's a large, walk-in space and, since we're always cooking and entertaining chez English, not to mention tending to a menagerie of animals, its lot in life has historically been one of various stages of disarray. Well, no more! An often overlooked area of creating organization is vertical space. Our pantry has a great deal of height that, until recently, we weren't taking full advantage of. To that end, Hubs put together some inexpensive, yet beautiful, pine shelving. These new units now house extra dinnerware sets, my ever expanding collection of baking equipment, platters, cake stands, pitchers and so much more. Pictured above is the shelving he made for surplus dinnerware (both for entertaining and photos). It's sturdy, affordable to construct, imminently utilitarian, and punctuated with his customary touches of whimsy. I love it. I now find my eye moving ever upward all over the house, wondering what other overlooked spaces I've neglected in my quest for organization and order. Walls, consider yourself forewarned. I've got you in my line of sight and I intend to make you work harder than you can possibly imagine. We're moving on up, ya'll. The good folks at Breathe Magazine have a great article in their newest issue on all things homesteading. Check out my fellow jam-making, chicken-tendering, work-slinging blog buddy Jessie Knadler as we chat about domesticity and gender equality. Breathe is also featuring giveaways for both my and Jessie's books. 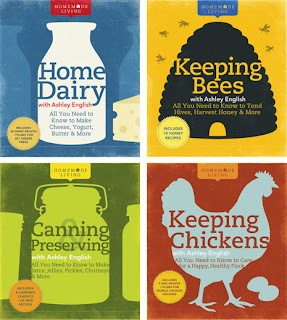 Click here to enter to win the Homemade Living book series (all four books!) and here to win my home girl's books. 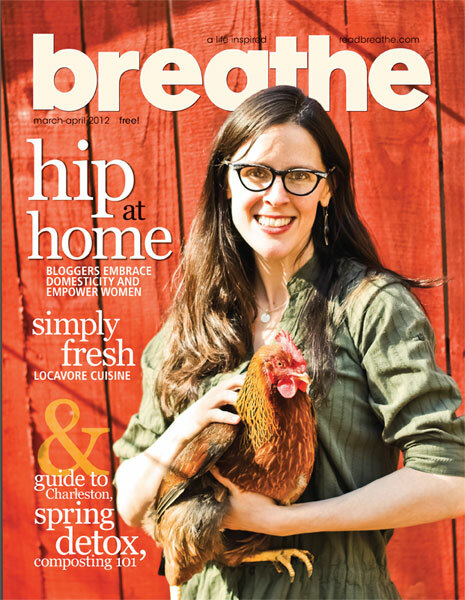 Big thanks to Breathe for including me in your wonderful publication! Happy Friday, friends! We were a house under siege this week, chez English. Some sort of weird and sudden stomach bug hit us hard Wednesday evening. Yesterday saw lots of moaning, groaning, belly-holding, and general lying about in bed, waiting for the discomfort to end. Today is much better, thanks to peppermint tea, Oscillococinum, Reed's ginger brew and good old Alka-Seltzer. These rough tummy romps make me so thankful for all of the other days that are without stomach assault. *I would really love to make it to the Heritage Harvest Festival this September (bonus: Joel Salatin!). *These winter salads all look divine. *This essay on How We Eat is eye-opening, and inspiring. 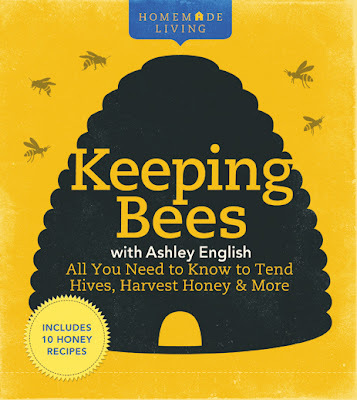 *Meg Paska, who is profiled in Keeping Bees, is in this gorgeous video. *Yes to more cottage industry foods! *Make your own kombucha scoby. *The Debutante Hunters stirred all kinds of emotions in me (thanks to Angela for clueing me in!). 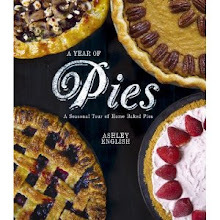 *Every cookie I've baked from this book has turned out wonderful. *Huxley has been requesting this song on repeat all week. *Asheville finally has its own downtown food truck lot, including Suzi's incredible eats! We're off on Sunday to the Organic Grower's School. Hubs and I plan to tag-team minding the tiny Englishman while each other attends classes. 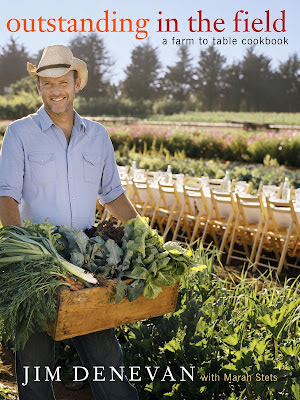 I'm going to Advanced Beekeeping and Preserving your Harvest with Lacto-Fermentation while he'll be checking out Real Life Forest Gardening & Farming and Effortless Edibles in the Landscape. SO excited!